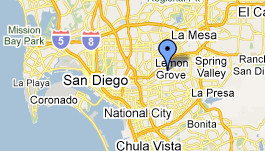 We are a little east of downtown, a little south of SDSU, a little west of Lemon Grove, and a little north of National City. You know you're getting close when you see the two red and white radio towers, which presumably is where our street got its name. We're two families that have chosen to start an urban farm together, and we're not totally sure what that means yet!